It probably comes as no surprise to readers that this blog is growing. 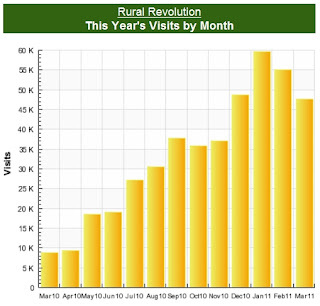 As of today, we're on target to exceed 62,000 visitors for the month. Ain't it cool? That said, it should also come as no surprise that we've picked up a troll or two along the way. I'm specifically addressing Becky. We deleted a snark from Becky last night, and she just graced us with another, even nastier snark because we didn't post her first one. Needless to say this most recent comment won't see the light of day either. I don't like feeding trolls. Trolls always seem surprised that this blog reflects our values, namely conservative Christian homeschoolers and homesteaders. Uh, hello? What else did you expect? I think it should be obvious by now that I welcome dissenting opinions as long as they're politely expressed. We have a reader in England who routinely disagrees with stuff I post, but she's not rude, crude, vulgar, or disgusting in her disagreements. Therefore I welcome her snarks. But Becky and some other trolls are different. Nasty name-calling of this caliber isn't the kind of stuff I want my kids to read. And make no mistake, my kids read the blog. Just as a reminder, this is a private blog. We control the content just as we moderate the comments that get posted. Trolls can post all the ugly revolting snarks they want, but they shouldn't be surprised when those comments get deleted. To all my faithful polite readers: Thank you for coming. You mean the world to me. To all my trolls: If you want to get nasty, go start your own blog. I often wonder why people (trolls) feel the need to leave snarky / condescending / or otherwise inappropriate comments. What do they hope to accomplish? That their snarkyness will suddenly become a revelation for others? Or is it the fact that they feel that they need to spend time and effort on ripping someone or something down (destructive behavior) because they don't disagree with them? Well said. That is one of the reasons this is my favorite blog. Congrats on the increasing readership. Trolls, flamethrowers, and baiters are part of the blogosphere, I guess, but I always wonder why they don't seek out their own kind and leave others alone. I'm sure you realize that there are many, many miserable and mean people out there. Here you and your family are looking like a rerun of "Leave It To Beaver" and you're driving them nuts. They are miserable and want everybody else to be miserable too. Your stuff is great. Keep it up. There should be a troll season!!! No bag limit. Thank you for keeping your blog clean and wholesome, thats one of the reasons I follow!! It does not matter how popular or famous you are. God sees everything and hears everything. Humble yourselves before the Lord and then you can go on from there. Do that and you can not fail. What the humanistic people consider failure may well be a tremendous success by God's way of thinking. Sorry for the preaching. I don't see why Blechkky pitched such a knickers-in-a-knot hissy fit because you deleted her filthy post. I mean after all, you posted her picture. Ain't that enough? You ain't posted no pictures of me and AP and we ain't whinin' and carryin' on, are we? No. So Blechkky just needs to dry up and shut her trash-toothed yap. I think people go hunting for blogs on which to leave mean comments. I had to start moderating comments after a not so nice person who preferred to remain anonymous (go figure) tore me a new one for something I had posted. If you can't say anything nice...go AWAY! Debbie, while I'd LIKE to claim conservatives would never lower themselves to post nasty snarks on liberal blogs, I'm afraid that's not always the case. I read a fair number of forums and believe me, the conservatives can be just as nasty as the liberals. Well, let me amend that. Usually the language is cleaner, but the sentiment can be just as ugly. Understand these aren't public figures who are writing the nasty stuff, but just ordinary joes. There's meanness on both sides, I guess. No one is a saint. Patrice, I'd like to add my thanks for your clean blog. I know it takes extra effort, and it is very much appreciated. While others would allow trolls just to boost drama-inspired visitor numbers, you've never done that. It speaks to your intelligence and class! "Trolls always seem surprised that this blog reflects our values, namely conservative Christian homeschoolers and homesteaders. Uh, hello? What else did you expect?" What I like about your blog, Patrice, is that you're upfront and honest. As I've noted in a past post, I don't agree with all of your views (I'm an atheist) but I respect your right to run your blog as you see fit. I don't visit to get a religious perspective. I visit (daily, I might add) because you folks are decent, down-to-earth citizens whom I would be pleased to have as neighbors. Although, since I live in Oregon, that's a bit hard to accomplish. Suffice to say, I appreciate your sharing your life with those of us who follow your blog and whole-heartedly agree with your cutting trolls off at the knees. Congratulations on the 62,000. You (and the HOtB) have earned it. it is just plain decent to express your views without being meanspirited..your blog is a delightful way to share those views with others. i get enough mean nasty remarks from my sister in law and even though i love her anyway, it is still nice to know that someone in the world shares some of my own humble opinions. God bless you. I love your blog and feel like you are my friend! If I read your blog every day-I'm 365 visits. 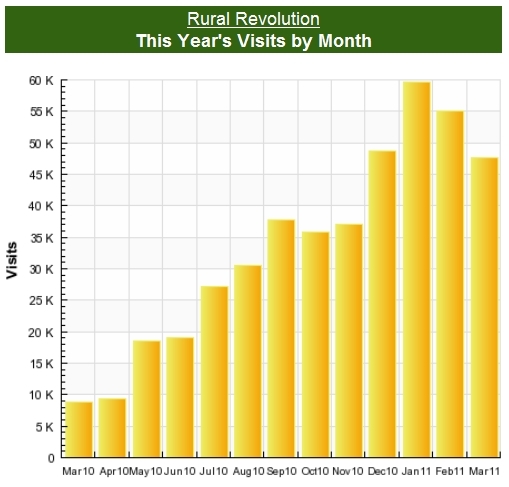 If I visit 2x/day-I'm 730 visits per year. Is that how it works? Or does it just count IP addresses? Congrats on the readership and with that many, there's bound to be a few 'snarks' in there somewhere. The slogan of the Snark Club is, "Equal misery for all!" I read because I feel like part of this family now. I love seeing the pictures and reading about the animals. Watching your animals watch their humans is a riot. Even after a rough day, I can drop in and see what a sunset looks like in your part of the country, and the roughness smooths out a bit. I'm glad to be one of 62,000! And trolls belong under a bridge... And I was sure they couldnt even read!! Thank you for the wonderful and informative blog. I enjoy it daily, sometimes multiple times a day. Sometimes I read the comments at the end of articles then wonder why as they get nasty and just plain foul. I love the I can read yours and not worry about that. I also like that when a "bad" link is in a comment, you are quick to remove it when it is found. Thanks. Know why I love your blog?? You, your family, and your values ... and, of course, your animals! Thank you to you and yours for sharing your life, opinions, humor and tips with us. All your hard work HAS changed lives and I am delighted your audience is growing in leaps and bounds. God bless. Just to be clear - not this Becky. It's a different Becky. I think I'll start signing off BeckyB so as not to get confused with Becky the troll. Dang shame. Aren't all Beckys supposed to be sweet? You know, Rebecca of Sunnybrook and all that? Aw, don't worry about it, BeckyB. The OTHER Becky is distinguished by her foul mouth and unhealthy opinions, something you clearly don't possess. So continue to sign your name with pride. Good news on the site hits Patrice! I've found your blog to be a nice place to see how others work on their 'version' of prepping. At least we live in a country that still allows people to decide (for the most part) how they want to live. In some euro countries, you'd be outlaws just for home schooling, not to mention everything else! 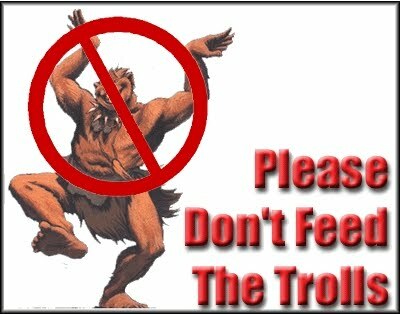 Some BBS and blogs I read let trolls post and then let the regulars beat up on them. Usually amounts to the proverbial 'purse fight'. I say delete troll posts and not even acknowledge their presence. Eventually they'll get bored and move on. The division between liberal and conservative in the US has been steadily widening and deepening to the point that I wonder if we don't need some geographical divisions as well as the philosophical ones. We have the red and blue states as a start, and there is a certain amount of latitude for those to establish their own ways, but with the steady encroachment of the central planners in DC, I don't know. There seems to be nowhere in the country that conservatives can go and be left alone to live a life of our choosing and not be hammered with reams of regulations and involuntary "contributions." This is not freedom. This is pasteurized freedom product. Tastes and looks like the real thing, but it's a manufactured version with artificial ingredients. You are what you eat. I control persons of this nature on my Blog using the htaccess file. It's super easy and very fast. Enter her IP address (or a range if she's using a dynamic IP) and it will make it more difficult for her to post.